Most salespeople already know what to do to sell more, but sometimes just a reminder is all you need to make it happen. So let’s hit a few biggees you can easily focus on to make this December your best month ever. Today may not be the day, but, “Nah, my birthday was last month,” is close enough to tie buying a new car to a great birthday gift…or just make it become the BIGGEST Christmas present ever for the whole family. 71% buy because they like their salesperson. 71% who don’t buy, said they didn’t like the salesperson. Find and develop some common ground fast, and the sale will be 71% easier. Your body language says it all. Learn the right words, learn to say them effectively, and learn to match your body language to what you’re saying and you’ll double your sales. The sale is made when you transfer your enthusiasm to your customer. 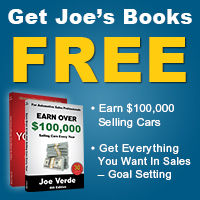 This month, fire up the enthusiasm you had when you first started selling cars and you’ll rock ‘n roll this month. A more efficient engine is a feature that helps you keep more money in your pocket at the gas station. A convertible has a folding top that makes those beautiful weekends more fun. It isn’t what YOU like that matters. Get over what you like about a vehicle if it isn’t what they like. You can drool over safety, but you’ll lose sales if that’s all you talk about to someone who wants to know more about performance and comfort. To get a sale, you have to ask. Some customers don’t seem serious, so we don’t ‘sell’ – but 8 out of 10 are going to buy somewhere. The average sale is made after 5 closing attempts, so follow our 8 Steps 100% of the time and close, close, close, close and close. Price is important – it’s just never most important. Focus on finding their hot button reasons for buying, then give each driver a targeted presentation on what they care most about. Spend 20 minutes every day this month learning to sell and Santa will be very good to you and your family. 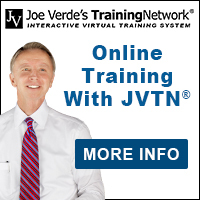 Whether you use JVTN®, my books, my newsletter, your workshop workbook or my free audios – spend 20 minutes every day on learning more, and you’ll sell more and earn more. Yep you’re busy, but you can steal 20 minutes every day on improving yourself for the greater good. Everything you do better affects you, your customers and your family.